distribution Statewide; undoubtedly occurs in every NC county, including those along the immediate coast. abundance Common to occasionally abundant across the state. Often the most numerous species seen on an outing in the spring season. Dozens can sometimes be seen in a day. flight Spring/early summer season only; mid-March to late June or early July downstate, and to early August in the mountains (where the flight begins in late March). It is infrequent downstate after the end of May. habitat Mainly at still or slow-moving water of ponds, lakes, and pools; rarely at slow creeks and rivers. behavior Males are often seen flying low over pools and ponds, perching quite frequently along the margins. Away from water, adults range widely to woodland margins, sunny roads and trails, and so forth, where they perch unwarily on twigs or other low vegetation and thus can be studied closely. 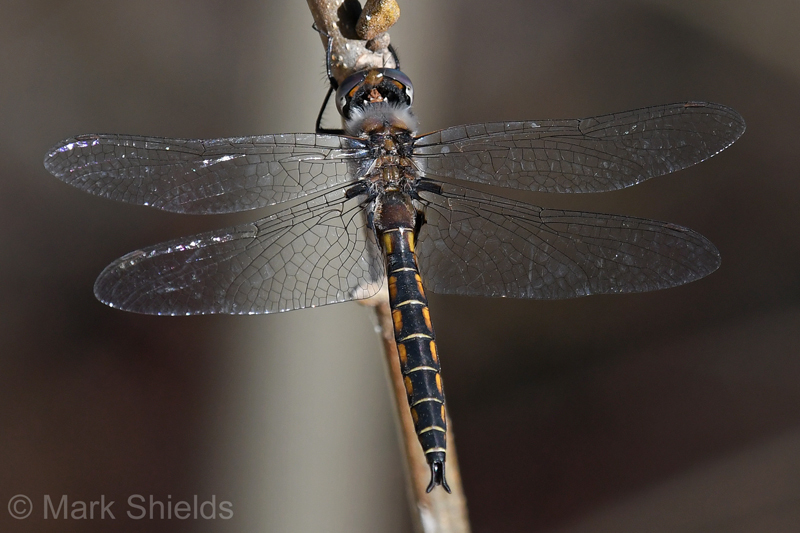 comments Identification of most baskettails (except Prince) can be tricky, as some Mantleds, most Slender, and especially Robust baskettails closely resemble the Common Baskettail. In fact, there is probably no single field mark that might identify a dragonfly as a Common; a suite of marks, such as abdomen shape, abdomen width, and wing coloration must be used. Nonetheless, observers will quickly tire of seeing this species in spring, in hopes of finding less numerous baskettails, darners, and skimmers.